(a) This can be solved using energy conservation, ignoring any potential outside forces, i.e. considering only the effect of the force of gravity on the child, as well as potential sources of energy loss (e.g. sound). Initially, as the child's feet leave the trampoline, she possesses only kinetic energy, given by K=1/2mv2. 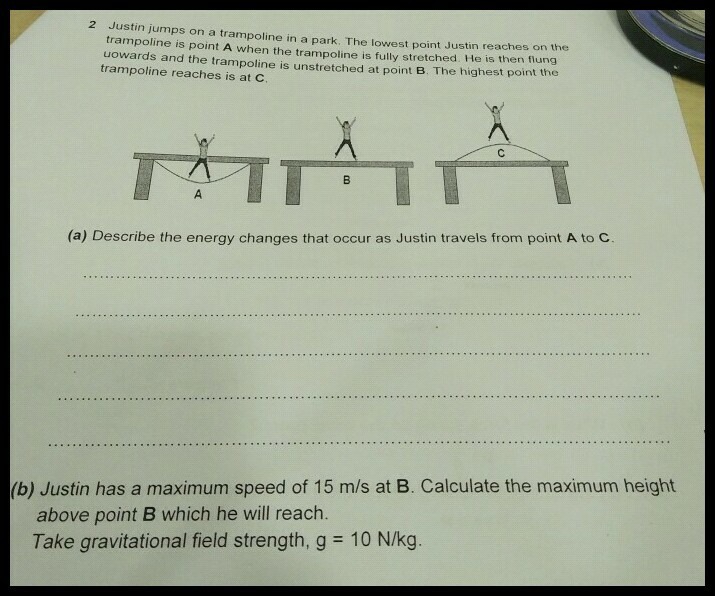 By the time Justin reaches maximum altitude, all of the possessed kinetic energy initially has been transformed into gravitational potential energy (U=mgh), which is observed as she stops rising and begins to fall back toward the trampoline. The final kinetic energy of the child, the energy she possesses at her maximum altitude, is zero, as is her initial gravitational potential energy. Height at point B =11.25 m.